Funky Autumn Gatcha At The Nest! Do you like gatcha? I bet you do! The Nest is having a big 4 day Guising & Gatcha party starting tomorrow! Guising is the same as trick or treating, for those who are not familiar with the term. [I wasn’t.] The Guising items are only $5L!! What a treat! Lots of great home & garden designers are participating, including my favorite – Funky Junk! The Nest Guising & Gatcha event begins on Friday October 28th and lasts until October 31st, and you won’t want to miss it!! Do you have a FilterCam from MechanizedLife? If you take photos in SL, you really should have one! I blogged about FilterCam back in 2009 and it still remains one of my favorite gadgets. But it just got even better with the new Expansion Pack! There are 5 new Preset banks for a total of 90 new presets! 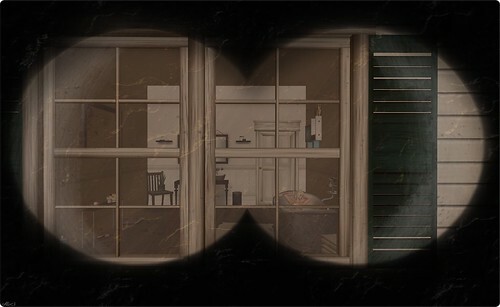 I’m using the Scopes bank with the Binoculars preset for this photo. If you’re not particularly skilled in Photoshop but you are looking to make your photos more fancy, you owe it to yourself to head over to MechanizedLife and pick up the new FilterCam Expansion Pack! Remember, you need the FilterCam to use it, so if you don’t have one, get one!! As for me…I think it’s time I invest in some curtains. Ooh, I hope you guys didn’t plan on saving your money this weekend, because well, you’re just not going to be able to! Lots of sales and events going on, like the opening of the October edition of Collabor88! I’m simply in love with everything this month, and I know you all will be too! Dresses by Ingenue, furniture from LISP Bazaar and Barnesworth Anubis, hair from Elikatira, and loads more… Oh you guys, it’s AMAZING! Collabor88 starts tomorrow, October 8th, so get your $L and go shop! There’s something about the crisp autumn nights that make you think anything is possible. Like maybe you’ll be standing outside, all dressed up, and Prince Charming will come sweep you off your feet! And if you’re in this gown by Kouse’s Sanctum, why wouldn’t he do just that? The new Juniper gowns are just oh so beautiful! The trim, the train, the ruffles – what’s not to love? The gowns come in several colors, and there are options for gold or silver trim. I’m wearing the gold trim because autumn is just made for gold! Every dress that Kouse makes, I swear it’s my new favorite, so I suggest you head on Kouse’s Sanctum and find your new favorite today!